We have released HelpSmith 6.3 that includes a new color selector with the possibility to re-use recent colors and define custom colors easily, optimizations for better stability of the Import/Export engines, and other improvements. 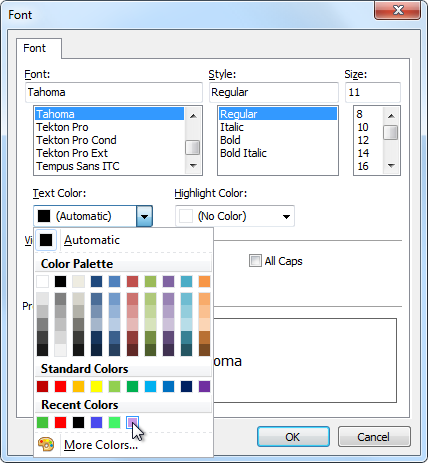 The new color selector introduced in HelpSmith 6.3 allows you to easily select a color from the color gallery. Also, the new control now displays recently used colors which are available within the application. In addition, the Color dialog that you use to define a custom color now supports the HTML/CSS notation (for example, you can enter a color code like #ff0000 or the color name such as “red”), and properly saves the colors added to the Custom Colors gallery. Now you can easily select an icon for a topic or another Table of Contents item from the drop-down gallery. Fixed the error with updating annotations in the topic that occurred when a paragraph contained more than one annotation table. Changing the size of an image in the Image Tool caused incorrect positions of annotations and controls in some cases. You can now access the Find/Go To feature at the bottom right corner of the word processor. Optimizations for better stability of the Import/Export engines. The Border dialog ignored the top border when displaying the common properties of all borders. An error occurred when pasting content from the Clipboard in some cases.